Still more dirt coming out about the supposed “Haunting in Connecticut” case. If you recall, I posted a few articles before about certain facts that were made to light in regards to the Snedeker family claims. Today I found this video from YouTube user “AtomicCEO” who video taped the original “A current Affair” episode on the haunting. Not only that, but this person claims that they lived in the supposed haunted house and never experienced any of the ghostly activities that the family claimed. This is the piece “A Current Affair” did on the alleged haunted house from “A Haunting in Connecticut” from A&E, and the upcoming movie “The Haunting in Connecticut”. If A Current Affair didn’t buy the story, I can’t believe this family keeps parlaying this load of crap into more money for themselves. It’s also funny how the story has changed from this piece to now. I lived in this house for two years after all this went down, and it’s true that it used to be a Funeral Parlor, but it was not haunted in any way that I could see. If you pay close attention to the CNN interview Carmen Snedeker did last year, at no point in it does she mention the ghostly rapes or sexual molestation that happened to her while in the house. 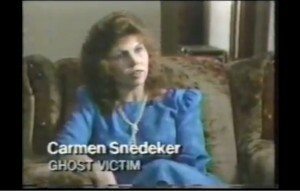 Although in this old interview, she makes it perfectly clear that her and her husband were sexually molested by the “ghosts”. Notice how the neighbor is being interviewed and she looks understandably frustrated with the whole ordeal. She states that they family’s claims are untrue and that their main motive was money, since they were 3 payments behind in their rent. I am going to take the other side here. I am a paranormal investigator and we have investigated a house multiple times for nearly 5 years. We have never had an investigation where we did not capture evidence in that home. Disembodied moan, possible meter interaction, a ton of grade A EVP’s that are crystal clear from male voices, female voices, and even the singing of a child and the home was built around 2000. It has had three owners. We have not been able to track down the first owner but located the second owner. The second owner said that nothing happened in the home and he lived there a little over two years. We don’t know why hauntings suddenly happen. They can be here one minute and gone the next. On the skeptical side, I would question any case where the Warrens were involved. Honestly, anyone who still wears a clip on bow shouldn’t be taken seriously. Only kidding. I thought the movie was really good. James, do you have a site with your stuff posted from the investigation? It would be great to be able to hear your recordings! I love how the whole point seems to be to keep kids from “The occult” and be safe by “Walking in faith”. Translation: Be a christian. I’m a skeptic: I believe that anything is possible, but I need some good hard evidence to sway me. Every case the warrens take seems to fall apart once you really look at it. In my opinion they’re 50% scam artists for profit, and 50% trying to convert those to what they think is the “right” religion. An ironic combination. There’s nothing ironic about it. If they are scam artist then they are not Christians or they are very confused. You need good hard evidence? So, you’re saying that if God exists then he has an obligation to prove it to you? Sorry, that video was taken down. I posted a few Adult Swim clips and they shut down my account… I can’t figure out how to get it back from Google. I was a renter in the 2nd/3rd floor of that house from 1996-1998ish with a few friends. It changed ownership and the new owner didn’t want to renew our lease so we moved out. We had no scares. Someone shared that Current Affair VHS tape with us and we chuckled at it. There was a very nice family with kids living on the 1st floor/basement level, and they didn’t know much about the haunted past, but also found the story funny rather than scary. I actually went to see the Warrens when they did one of their travelling shows at Yale, and I had a quick chat with Ed after the show. He seemed utterly convinced it was haunted and said something like “Good Lord, you actually *live* in that house! ?” and then something about how he guessed the exorcism worked. Anyway, my opinion is it’s a story that obviously improved over time. I don’t put any stock in it.